Quick and easy projects – aren’t they the best kind? This week’s tutorial can be whipped up in less than 15 minutes, and I bet you can find 15 ways to use a cute zippered pouch, too! First, iron your transfer onto your fabric. Print the graphic on the transfer paper, then iron according to the directions on the package. This is the Iron on Transfer Paper that we recommend at TGF, it’s the best that we have found by far!! Your projects will turn out so much nicer and it’s super easy to use! If you let it completely cool, it will peel off much easier. Trim out the images, with the Pinking Shears, giving about a 1/2 inch seam allowance. I trimmed mine out with shears to prevent fraying. After each side is together on the zipper, using the sewing pins to pin them together along one side. Make sure to keep an eye on the print so that it’s lined up properly and pin so you sew just inside the edge of the printed portion. After you sew one side, do the bottom, unzip the zipper, then sew up the third side. Turn it out and you’re done! It’s cute enough to use as a little clutch when you only need a few essentials. The transfer material makes it feel somewhat like oilcloth – but the bonus is you can make your own “fabric” simply by using graphics! If you have time, I’d love a visit over on my blog at The Shabby Creek Cottage. this is so BEAUTIFUL! going to try it, Happy New year! Love this! Pinned it to my “When Cuteness meets Practicality” board. Have a wonderfully creaive 2013. Thank you for this! I love the older handprinted style. so fun! 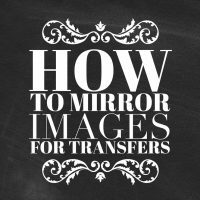 not sure how you did transfer. is that on your blog too??? will it work with ink jet printer?? Gina used Iron on Transfer paper, you just pop it in to your ink jet printer and print on it, then you iron it onto your fabric. Make sure you follow the instructions on the package as different brands may have different instructions. Gina this is so cute…also loved your tutorial on putting in the zipper! It’s been a LONG time since I have done it and really needed a refresher on it. I’m into pillows right now and it’s soooo nice to be able to take them off and wash them. Thanks for the cute little pouch and the tutorials!! so cute! I’ve had a clutch like this I found on Etsy pinned for the past year and still haven’t made one yet. one day! so pretty! This is a very cool project! thank you for sharing. This is a very cool project! Thanks for sharing. OMG!!!! This is soooooooo cool!!!!!! I’ve bookmarked this page & Gina’s page on how to do a zipper ’cause I’ve always been intimidated by them & have avoided them like the plague…I think it’s time to conquer that fear!!! I’m not able to try this yet, but, I AM gonna try it…wish me luck!!! I am glad to reread the transfer and zipper instructions. I haven't made a zippered pillow in ages and have tons of material to make some. Thanks for sharing Gina and Karen. hello, I look with great interest your site for a few days after meals spent with friends and family during the holidays. 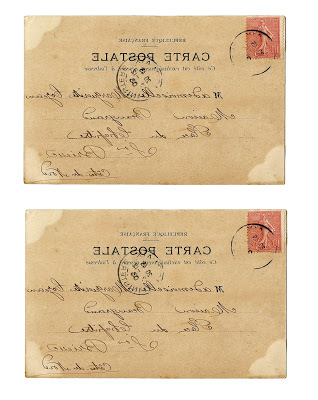 Curiously, by chance I have seen a letter which spoke to me because I live in a small village (La Méaugon near Saint Brieuc in Brittany France). Information to Beaugrand was the name of a merchant family in the city center of Saint Brieuc. Oh how fun!! Thanks for sharing that story Daniele! This is fantastic! Great idea. I can't wait to make some of these! This is such a great idea. Now I have to get my zipper sewing down…and ink for my printer. I love this idea, I have several letters with envelopes that were written between my great grandfather, his sister and their mother; my great great grandmother. 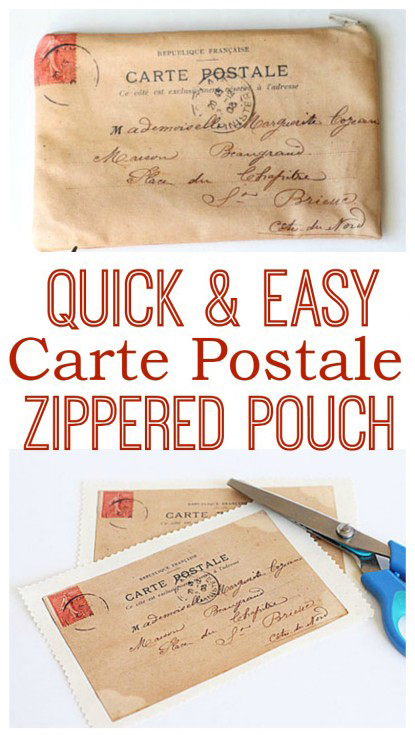 I’d love to make a large bag with all the old letters and envelopes. Love this!!! That would be such a special project Rhoni! GINA-Thanks for the inspiration. 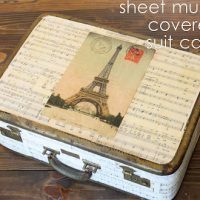 I have loads of postcards I’ve collected from places I visisted that I could use to make this little purse! That’s such a great idea Rosemary!! Have fun making this project! I am not sure how to enlarge my print. Could you tell me what percentage to enlarge? With a 8″ zipper, the design appears too small at 100%. Hi Charlene, this post was done by my friend Gina over at The Shabby Creek Cottage, it looks to me like she just did it at 100 percent. Maybe print it out and then see if the zipper fits? Sorry I couldn’t be more helpful 🙂 Good luck! What a great idea! 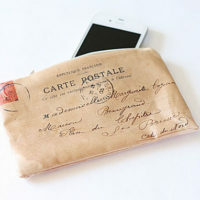 Lovely zippered pouch! THanks so much Mia, I am so happy you like it! Do you use the reverse image to copy onto the transfer paper and then when ironed onto the fabric it is the right way? Yes Judy, you need to do it reverse whenever there are words or they are backwards once you iron them on. Images you can get away with, but they to are reversed. Where can I purchase the Artists Transfer Paper? 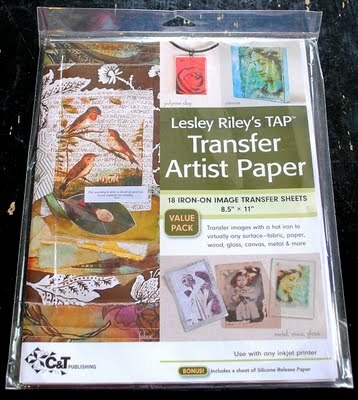 Rae Ann, I’m afraid our recommended Transfer Paper “Tap” is out of stock right now. The manufacturer is trying to come up with a new formula, as they are not able to get ahold of one of the key ingredients anymore. We hope they will make it again soon!